Jan 28, 2019. The Household Hazardous Waste event will take place on April 27, 2019, from 7:00am - 2:00pm. You can bring your used books and donations for Books and a Blanket. For more information, see: www.twinoakshhw.com. Dec 3, 2018. Harper and Maggie were honored to receive an invitation to join friends and family for President Bush’s Air Force One Departure Ceremony. President Bush prioritized selfless service, something near and dear to Books and a Blanket, too. We are saddened by President Bush’s passing, honored to have met him when we received the Points of Light award, and thankful for his leadership. Read more about the experience here. Books and a Blanket Highlighted in the Eagle. Nov 22, 2018. 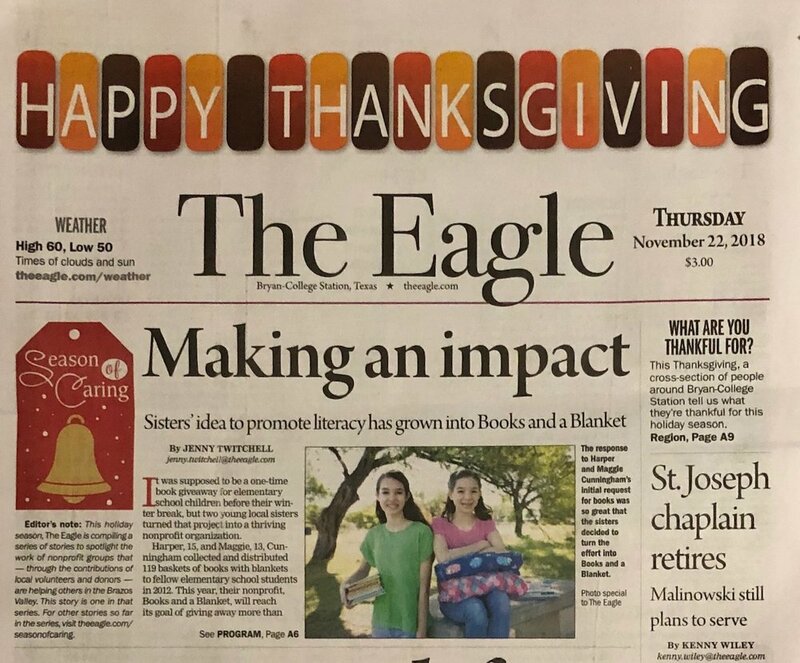 The Eagle highlighted Books and a Blanket and the work Harper and Maggie do in the community. You can read more here. Thank you for the great story! Nov 26, 2018. 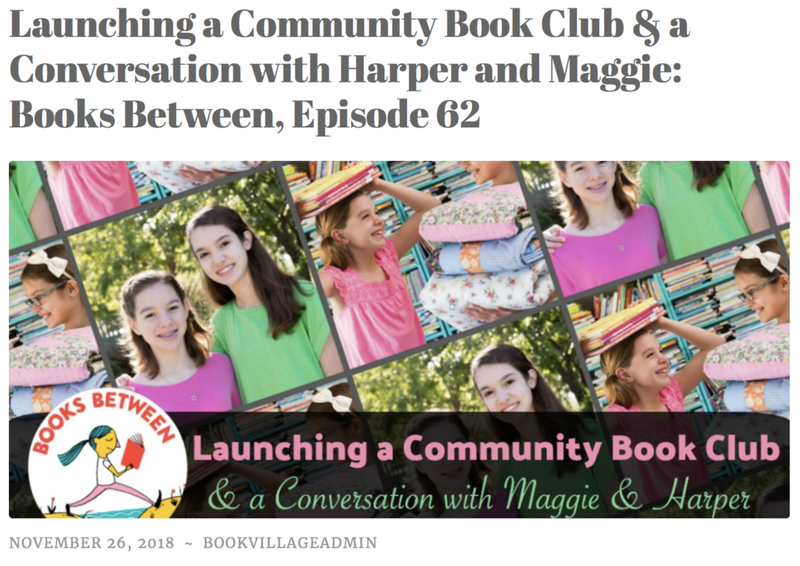 MG Book Village—a place for middle-grade book lovers to share and connect—has a new story about Books and a Blanket. We loved reading it. Thank you for reaching out to us. Books and a Blanket Partnering with Twin Oaks HHW. Sept 24, 2017. 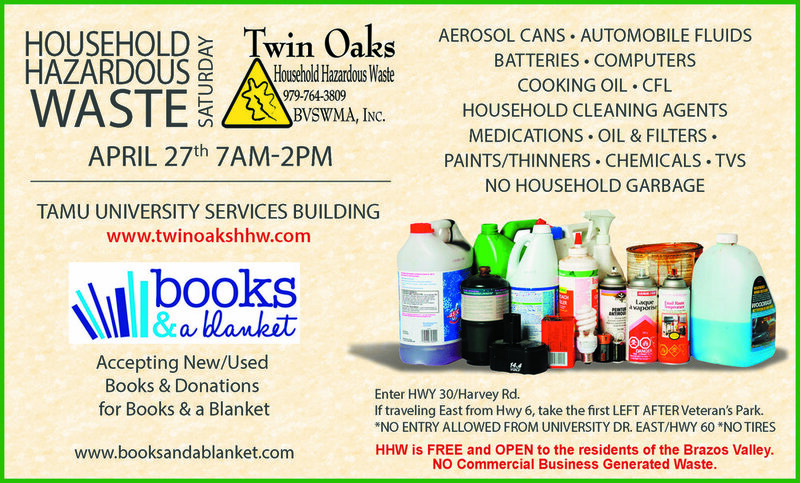 Books and a Blanket is partnering with Twin Oaks Household Hazardous Waste again this year for the Household Hazardous Waste Collection. You can drop off your hazardous waste and bring by new or used books in the process. We will also accpet donations. The event is Saturday, October 21, 2017, from 7 am to 2 pm, at the TAMU University Services Building. Books and a Blanket Featured on Germany TV Show. September 4, 2017. Harper and Maggie were featured on a television show in Germany via RTL Kommunikation. You can watch a portion of the segment here. Aug 30, 2017. Books and a Blanket was pleased to do our part in assisting with the Hurricane Harvey Recovery. We were able to donate 140 collections for children who were affected by flooding in Houston. That's 140 blankets and 2,100 books for children in need! 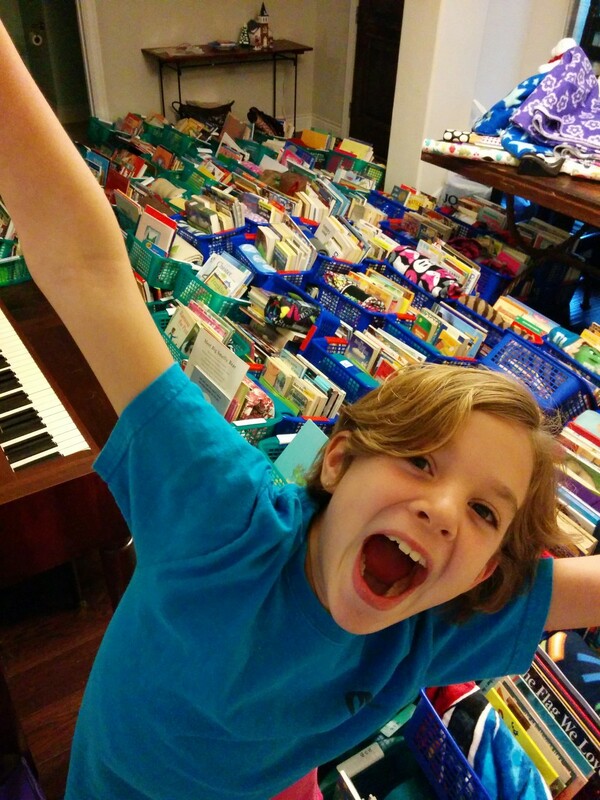 Books and a Blanket Set to Deliver 25,000 books this year! December 4, 2016. Harper and Maggie have been hard at work since the Spring. And, they have had plenty of help, with volunteers from the community, local high schools, area civic groups, Texas A&M groups, and even helpers from out of town. 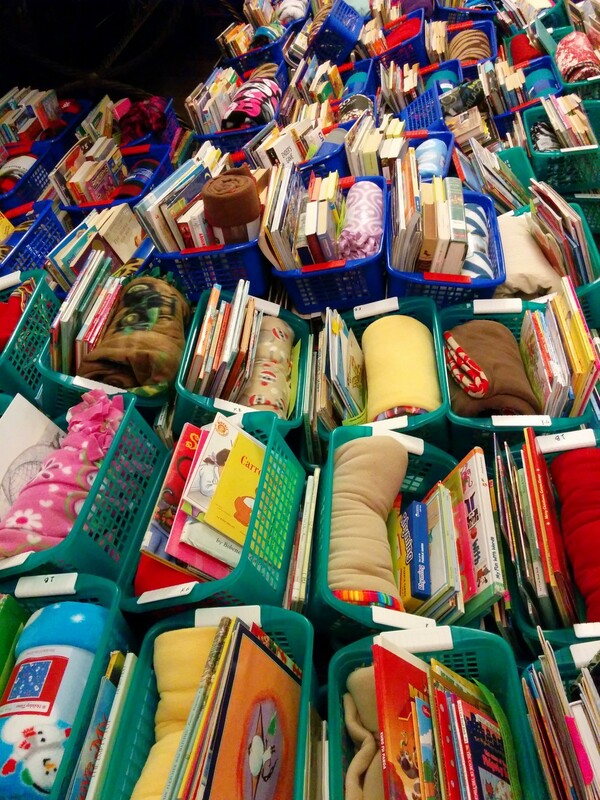 As a result, Books and a Blanket will deliver 25,000 books this year to children in need. Delivers start on December 6 and will continue into next week. We thank you and all the people who made this possible. August 6, 2016. Harper and Maggie were recently highlighted on Amy Poehler's Smart Girls. You can read the article here. As we are sure you know, this awesome organization, "is dedicated to helping young people cultivate their authentic selves." They focus on intelligence, imagination, and curiosity. They are a place where people can be their authentic selves. We are thrilled to be highlighted by Amy Poehler's Smart Girls and look forward to following other developments in this great organization. June 16, 2016. 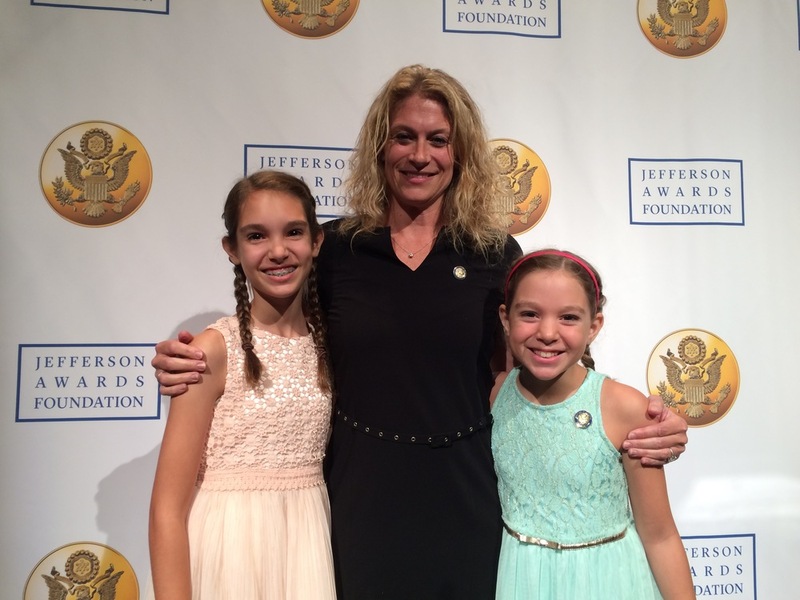 Harper and Maggie were thrilled to participate in the 2016 Jefferson Award Foundation events in Washington, DC. They were able to share their story of providing books and a blanket to children in need, thereby enhancing the children's literacy and well-being. Harper and Maggie were able able to meet amazing students who participate in various Jefferson activities (see more here), hear the powerful stories of passionate volunteers from around the country, and meet Kyle Zimmer from First Book. While in DC, the girls also met with Representative Flores, who presented them with a copy of the speech he gave recognizing their efforts; the speech is now part of the Congressional Record! Finally, Harper and Maggie had a chance to visit the Library of Congress, which seemed like a natural fit. The event was a wonderful opportunity to celebrate public service and learn ways to spread the impact of Books and a Blanket. May 8, 2016. 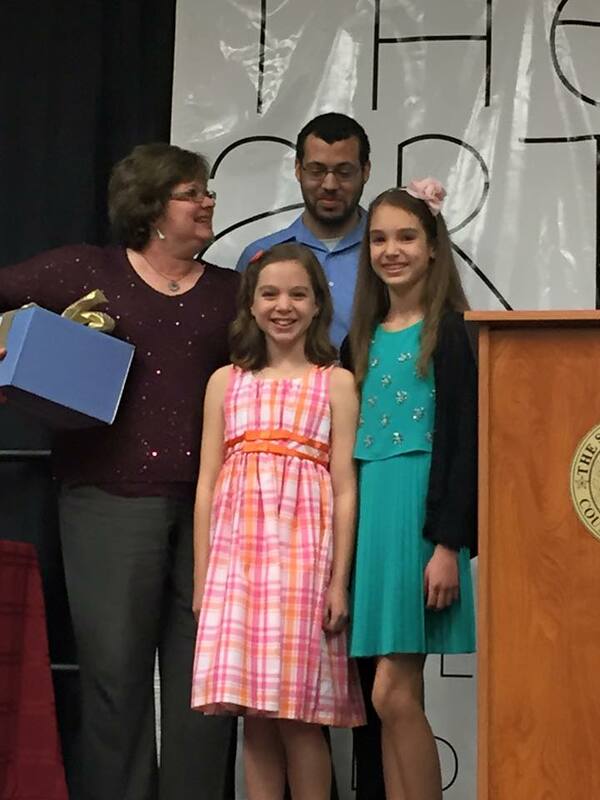 Harper and Maggie received the 2016 Brazos Valley Jefferson Award (see a story here). This award recognizes people engaging in public service to better their communities (learn more here). What's more, Books and a Blanket was chosen to represent the 7 county area at the national level, in Washington DC. Books and a Blanket was also honored to be recognized by long-time supporter, Representative Bill Flores. Representative Flores spoke on the House floor about the Harper and Maggie's recognition. You can find the full video here. March 7, 2016. 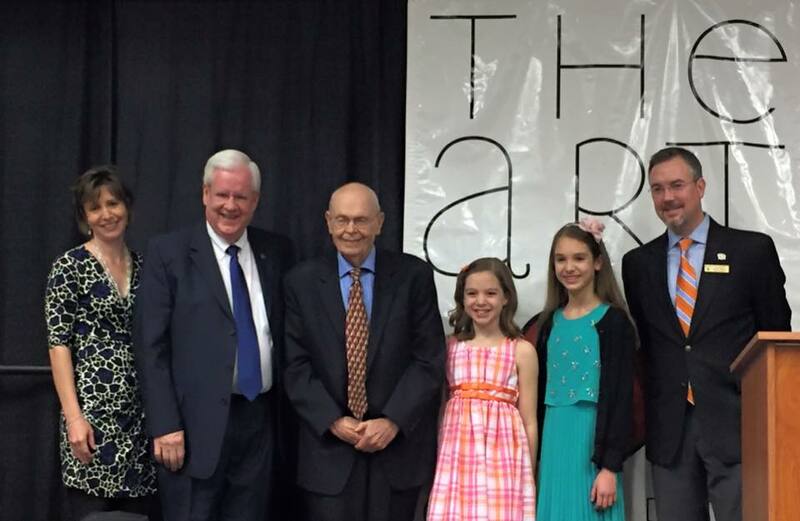 Harper and Maggie received the 2016 Ronnie Jackson Friends of Children Award. Part of the Voices for Children organization, this ward recognizes people and organizations that help children in need in the Brazos Valley. The award's namesake was an exceptional model for this behavior, as he was a warm, caring man who helped many children. Books and Blanket is proud and honored to receive such recognition. October 19, 2015. Harper and Maggie have been awarded the Daily Point of Light Award #5590! This award, from President Bush's Points of Light organization, celebrates the power of the individual to spark change and improve the world. You can read more about the release here: http://www.pointsoflight.org/programs/recognition/dpol/awards/5590. In addition to receiving the wonderful honor, Harper and Maggie were able to meet and shake hands with President Bush! You can find out more about the prize here: http://barronprize.org/about-us/. The bio of the recipients this year can be found here: http://barronprize.org/meet-the-winners/2015-winners/. September 16, 2015. Books and a Blanket is hosting the inaugural Books, Blankets, and Pasta event on Saturday, October 10, from 5:30-7:30, at St. Thomas Episcopal Church located at 906 George Bush Drive. Admiral Catering is generously sponsoring the event. This promises to be a delightful evening where local school children will be the hosts, waiters, and clean up crew of a pasta dinner. This fundraising event will also feature a silent auction and presentation by Books and a Blanket. Tickets are $25 and are on sale now by going here. Sponsorship packages are also available. Join us for Books, Blankets, and Pasta on October 10th! For more information, contact booksandablanket@gmail.com. April 2, 2015. The State Challenge is going well. We have had participants from Alaska, Virginia, Ohio, Oklahoma, and Florida, just to name a few. If you have not done so already, be sure to (1) donate books to children in your state, or (2) make a donation by going here. Make sure your state is represented! The Family Fun magazine crew collecting books for the State Challenge. Then, print our logo and take a picture. After you donate, send us a picture of you with our logo and tell us what state you represent. You can send your pictures to booksandablanket@gmail.com. We look forward to seeing the pictures and seeing which state has the most participation! Books and a Blanket Reaches 802 Children! December 24, 2014. When we started Books and a Blanket, we anticipating providing a handful of books and a warm blanket to about 20 children. This proved to be a poor estimation, as the first year, we reached 119 children and distributed approximately 1,200 books. The next year, we increased the reach, distributing a basket of books and a blanket to 330 children (about 5,000 books). This year, the growth continued. We were able to extend our reach into 6 school districts. We distributed books and a blanket to 802 children in need. That comes to 802 blankets and 12,030 books! We are so thankful for people's generosity. They donated money, books, blankets, and time. We had volunteers as young as 4 and as old as 80. Without everyone's help and giving spirit, none of this would be possible. December 16, 2014. We are so thankful for all the donations and help we have received. This year, we are on track to donate the most ever, and it certainly requires help from all of our friends, and even some new friends. 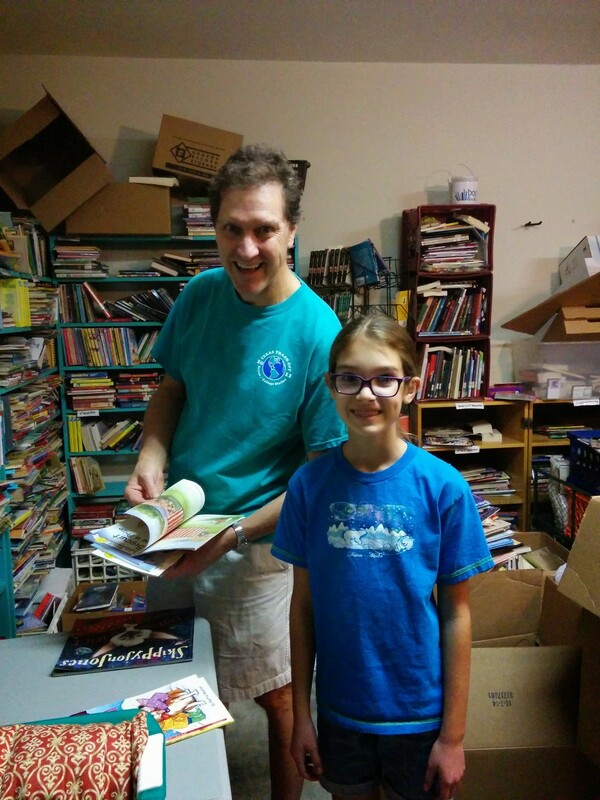 On Sunday, we had a great assembly line of 10 people, ages 4-80, helping load the crates. We certainly could not do this without their help. November 22, 2014. Last night, Texas A&M students took part in a bowl-a-thon to benefit Books and a Blanket. As part of their first year learning community, Health students engaged in a service learning project to help local children. Students collected flat pledges or monies per-pen they knocked down, and the end result was nearly $800 in donations! That is a lot of books. We are so thankful to Dr. McKyer and her students. Their hard work and generosity will make a meaningful difference to children in the Brazos Valley this winter. November 9, 2014. 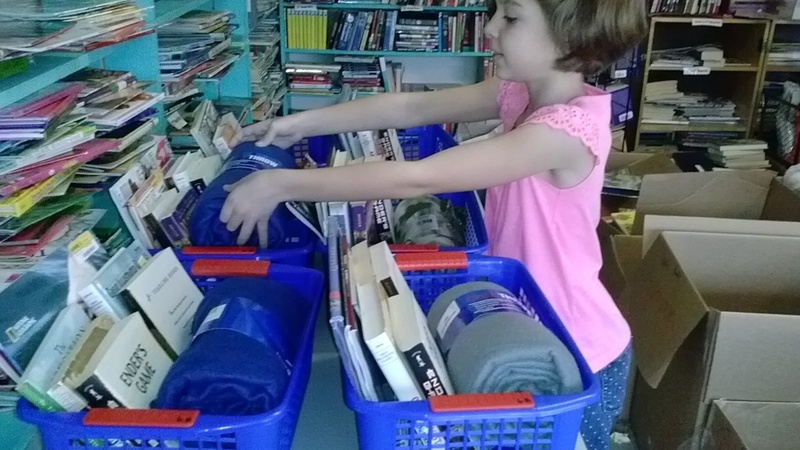 We have had a busy couple of months, gathering books, blankets, and other donations. We are very appreciative of the generosity so many individuals and local civic organizations have shown. 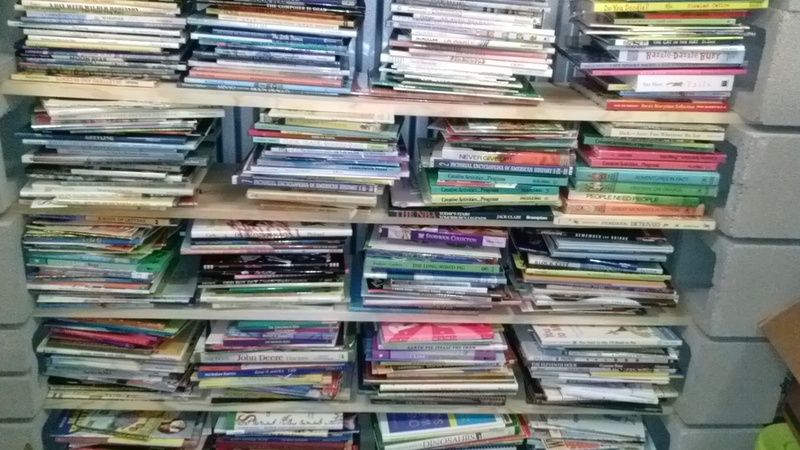 The good news is we have 988 children who we will deliver books and a blanket to this year. That is 988 blankets and close to 15,000 books! We will be able to reach children in need in Bryan, College Station, Hearne, Navasota, Sommerville, and Brenham. We have about one month to go. If you have extra books, would like to participate in blanket making parties, or want to be involved in other ways, please let us know. Books and Cookies: What Could be Better? September 3, 2014. We are excited to announce that one of our generous sponsors, Blue Baker, is supporting a profit-share with Books and a Blanket. From September 8 through September 12, Blue Baker will sell cookies in the shape of books, with all proceeds benefiting Books and a Blanket. Be sure to stop by either of the locations (Dominic or University) to get your cookies. Blue Baker cookies in the shape of books! All proceeds go to Books and a Blanket. August 29, 2014. The Books and a Blanket crew was able to visit Congressman Flores this afternoon to discuss the projects on which we are working. We appreciate his kindness and generosity. It was a great day for him to learn about our projects and us to learn about his, too. 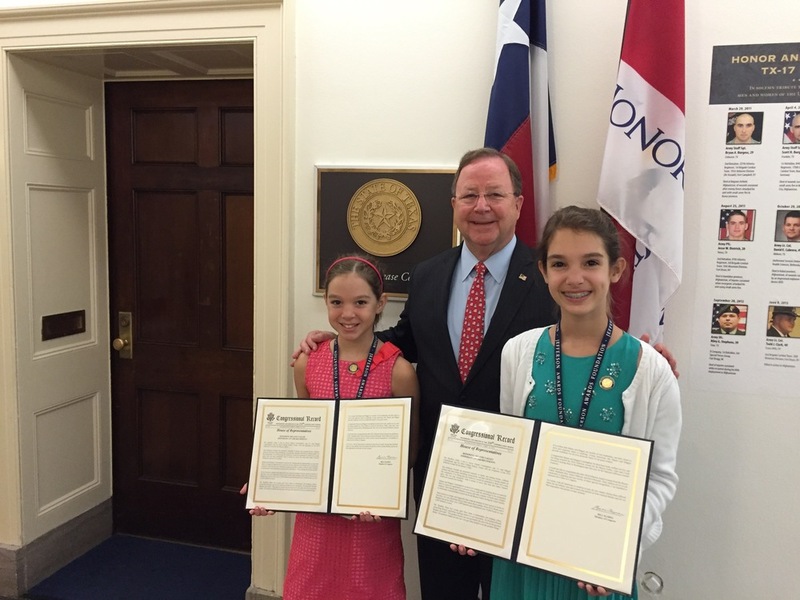 Harper and Maggie with Congressman Flores (R-TX). We are now eligible for a variety of grants offered in the community, state, and nation. If you have questions, please let us know. This is certainly exciting news! On the Today Show with Kathie Lee and Hoda! July 25, 2014. The Books and a Blanket crew was invited to New York to appear on the Today Show. We spoke with Kathie Lee and Hoda about our project and the impact it is having on the community. A picture is below, and you can see the entire interview here. Books and a Blanket was on the Today Show with Kathie Lee and Hoda! June 9, 2014. We are so excited to announce that we recently were named one of four grand prize winners for a Family Fun Magazine grant. This award will allow us to provides baskets of books and a blanket to even more children from a number of different communities. One of the pictures from the magazine is posted below, and you can read more about the prize here. Maggie in Family Fun Magazine.